Snorkeling can be learned and enjoyed by nearly everyone. Most master it within their first excursion. We provide expert instruction for people of all ages and experience levels. We welcome everyone! If you are a non-swimmer or have a disability we can accommodate you as well. We will provide enough staff to assist anyone at no additional charge. 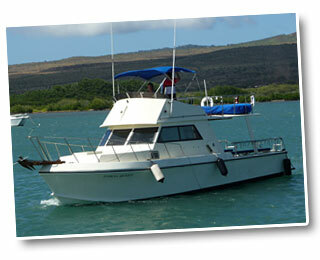 We will do everything we can to make you feel comfortable, relaxed and safe while exploring Molokai's reef. To prepare for your trip we will have you come into the Molokai Fish and Dive the	day prior to get your gear personally fit. All equipment is safe, sanitized and Scuba quality. So you can rest assured that you will be comfortable in the water. Our trips begin from Kaunakakai Harbor on one of our US Coast Guard certified commercial vessels- the Ama Lua or the Coral Queen. On the morning of the trip the Captain and the Dive master will determine the snorkel site based on conditions to ensure the best possible experience. 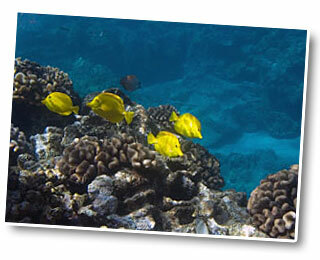 We choose from about 25 different snorkel sites along the coast. The boat ride usually lasts about 20-35 minutes depending on location. Sometimes we even get a pod of Spinner or Bottle Nose dolphins that accompany us to the snorkel site. There we will anchor in 8-12 feet of water about 1/2 - 1 mile off shore. Visibility typically ranges anywhere from 40 to 200 feet and water temperatures range between 75-80 degrees depending on time of year. Typically guests will snorkel for about an hour at each location although this depends on the group. During your trip we will stop in 2 different locations. The first site we stop at is usually on the upper reef where you will see a wide variety of tropical fish, coral structures and other wildlife. The second location we visit is a bit more sandy and rocky - the Green Sea Turtles favorite! 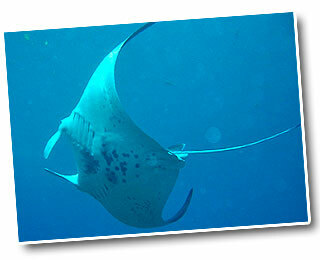 At this location you are likely to see Spotted Eagle Rays and Green Sea Turtles. Although these types of areas are also friends to creatures such as the Hawksbill turtle, the Hawaiian Monk Seal, Octopus, and Manta Rays. During "Whale Season" (December-March) the waters off of Molokai's South Shore are filled with anywhere from 8,000 to 10,000 whales; so some snorkelers are fortunate enough to hear the whales "singing" to one another from time to time. Your experience exploring Molokai's reef will be like no other and hopefully an unforgettable memory of your time spent on the most Hawaiian island. We look forward to seeing you soon! Your safety is our #1 priority. 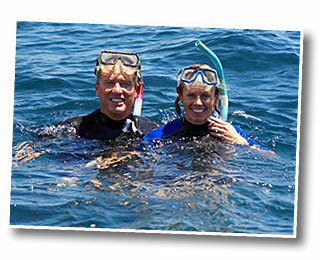 We take a variety of measures to ensure that you have a great time while snorkeling with us.